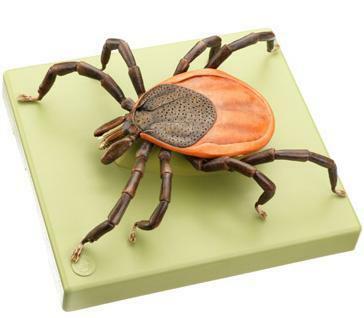 This is a female model of sheep tick or lxodes ricinus, made in 'SOMSO-Plast'. The enlarged model on a scale of 1 : 75 is 28 cm long, 6 cm high and 25 cm in width and weighs 0.222 kg. Cannot be dismantled. Comes mounted on plinth from which it can be removed.